The entire celebrity guest-list and pictures from the big-fat wedding of Isha Ambani and Anand Piramal! Asia’s richest man and oil-and-telecom tycoon Mukesh Ambani’s daughter and heiress of the Ambani empire - Isha Ambani is going to tie the knot to billionaire Ajay Piramal’s son - Anand Piramal today and the #weddingshenanigans have begun. If the pre-wedding festivities were not proof already, here’s saying that this wedding is going to be the biggest affair the country has ever seen! After all the estimated budget for the big-fat Ambani-Piramal wedding is $100 million! Which is just a 10 Mil short to the royal wedding of Prince Charles and Princess Diana! *yes you read that right* The wedding is taking place at the Ambani’s residence - Antilia! Because hey, if you reside in the world’s most expensive residence, why not get married there itself? 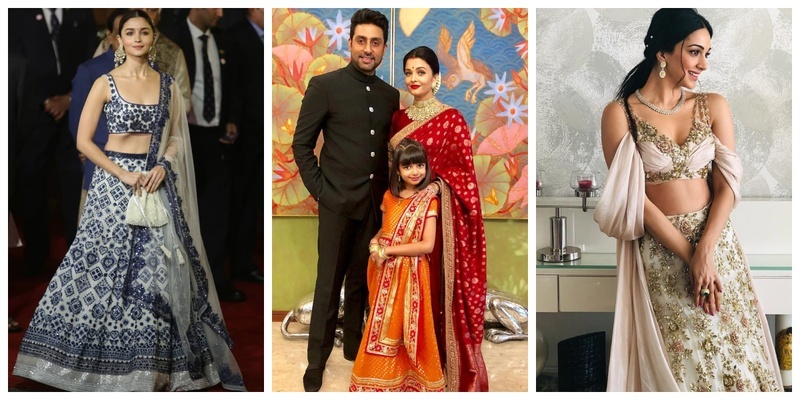 Totally digging Ash's red Sabyasachi saree! Former President Pranab Mukherjee came in with Anil Ambani. Well well, this sure seems dreamy and here’s awaiting the couple’s official wedding pics!